What Are The Complications Of Exotropia? Exotropia is a category of Strabismus, a defect in which one’s eyes deviate outward or away from each other. The disease can either be in one eye or both. Although Exotropia can occur at any age, younger children are majorly targeted. The risks of Exotropia are equal in both male and female. In addition, it is also known as divergent or wall-eye Strabismus. Muscle disco-ordination: Several muscles work together and help in the eye movement. 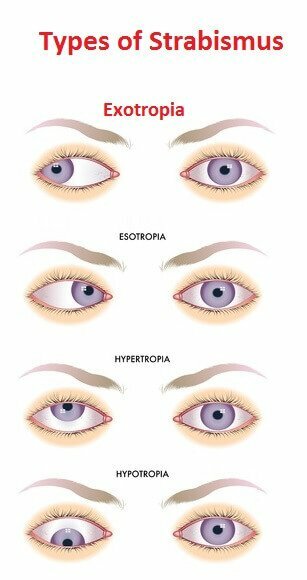 There is a rhythmic co-ordination among these muscles and if any of the muscle functions abnormally different types of Strabismus including Exotropia may rise. Eye injuries: Constant eye injuries like eye bleeding, eye swelling, traumatic iris and hyphema can increase the risk of Exotropia. Therefore, it is necessary to treat these injuries and keep a check on your eye health. Genetic disorder: Disorders in your eye gene can be another main cause of Exotropia. This disorder is the main reason in children born with Exotropia. Head trauma: Defect in the nerves that are connected to eye movements and transmit impulse causes head trauma giving rise to this disease. Excess use of technologies: This is another growing cause of exotropia in the younger generation. Sitting in front of the computer for hours can strain your eyes and may give rise to Strabismus. 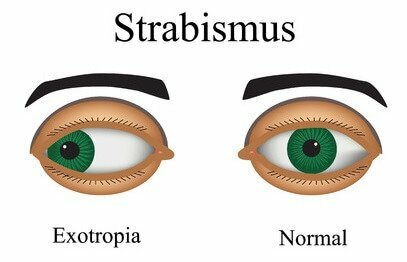 Other causes: Certain conditions like hydrocephalus, Down syndrome, brain tumors and cerebral palsy causes Strabismus, leading to Exotropia. Vision loss: Untreated exotropia can give rise to blurred vision and further increase the risk of permanent loss of vision. Constant Exotropia: Untreated intermittent Exotropia can change into permanent Exotropia which finally results in vision loss. Other complications: There is possibility of complications after surgery as well. 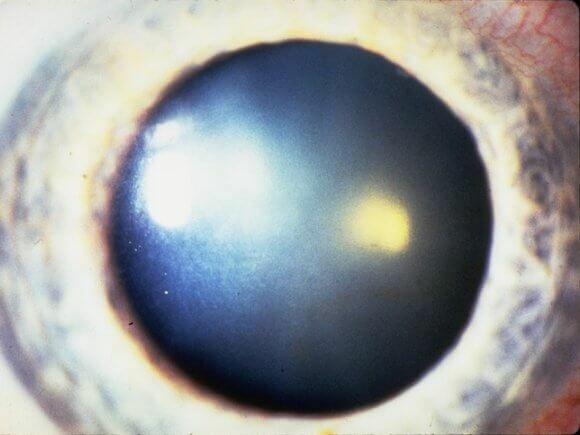 Sometimes, Exotropia is not completely treated with surgeries and these complications include bleeding, infections and swelling of your eyelids. Appearance: Exotropia is firstly seen by the parents and neighbors, as there are physical and noticeable changes in the eyes of the patient. Ocular motility exam: This examination is conducted by the doctor in which your eye’s ability to move in all direction is examined. The test is followed by a number of physical tests which is later determined by the doctor. Alignment: Alignment is another set of physical test where the teamwork of both the eyes is tested by covering and uncovering one eye and other. It is then focused by using a prism. Refraction: The test governs an applicable recommendation lens power one needs to pay for any sort of refractive errors if present. Visual acuity exam: This examination determines the extent of vision up to which it is affected. The test consists of reading alphabets that are kept away at specific distance. Other examinations: Certain nonsurgical examinations include cycloplegic refraction, retina (fundus) examination and external or slit lamp test. Vision therapy: Optometric vision therapy includes physical sessions which help in enhancing brain’s ability to control eye function, eye alignment, visual processing and eye movements. Moreover, it includes the training of eye muscles as well. Orthoptics: Orthoptics train your eye muscles promoting a strong and powerful vision. Its sessions are mostly used to treat strabismus. BOTOX: Botullinum toxin (BOTOX) injections have been studied to cure secondary Exotropia. Occlusion: Alternative patching or mending of dominant eye is advised to interpose the procedure of suppression and lessen Exotropia. Glasses: Spectacles with appropriate power can help in reducing Exotropia. Moreover, minus lenses are approachable. Make sure you visit your doctor before going for any treatment. Surgery: Surgery is needed if the condition is too serious to handle (eyes are skewed). It is mostly conducted by an orthoptist or ophthalmologist who includes weakening the lateral rectus muscle or strengthening the medial rectus muscle or sometimes both.